Harry “Rabbit” Angstrom is getting old and it is not going gracefully. He’s a good-looking twenty-six-year old man but he’s starting to feel it in his mind and body. Unfortunately for his sake and the sake of his young family, his soul can’t keep up and his decision-making in turn has suffered. Physically, Harry can’t run like he used to because of his penchant for smoking when dealing with adversity, he also believes his wife Janice has lost her looks after going through the push/pull of bearing a child and her chain-smoking ways. She is also the worst kind of alcoholic, an angry one, but even with a young toddler at home and another on the way Rabbit still maintains an immaturity that shirks responsibility and sound judgment. For Harry, he still views himself as a hard-nosed competitor with moments of discipline and willpower which emboldens him to quit cigarettes and takes up running as his preferred mode of travel indicating his willingness to survive. Janice on the other hand is an incompetent mother leaving their infant son Nelson with the grandparents so she can pickle herself more regularly. She gives the impression to the reader, that she has been defeated by life, in Harry’s eyes she is salvageable, but at this point she is death warmed over waiting for the reaper. The rabbit feels trapped, Harry must free himself from the weight, and he needs a get out of jail free card and needs one fast. He decides to take a long drive to go get cigarettes that he no longer smokes and on his way he decides to drive south towards idyllic Florida escaping the misery of Philadelphia, because in his mind if you aren’t moving forward your moving backward, and if you aren’t running your standing still. What came first, John Gray’s Men Are from Mars, Women Are from Venus, or John Updike’s Rabbit, Run that set the reputation that all men are lying, cheating, non-committal pigs? Is it in our disposition? Do women bring out the worst in us? Or should we be thankful that they make us aware of our weaknesses? Or for that matter should men just say screw it and scream IT’S EVOLUTION BABY? I believe the right answer depends on who you are talking to. 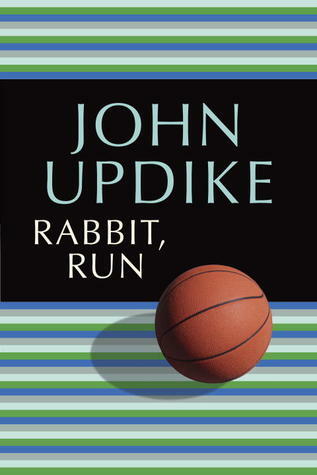 Rabbit, Run is a story about a man’s struggle with adulthood and mortality while still holding the joy’s of childhood dear to his heart and mind. He frequently rides both sides of the fence at times playing basketball with children in the park, and willingly undertaking domestic responsibility as a husband and father. His problem is that he can never fully commit to either existence which many of his family and friends take issue with. To me this story is emblematic of the glorified and nurtured athlete of today’s world and the idea of settling down in the real world. The risk in settling for mediocrity or escaping for something more exhilarating is too much for some even if they seem to be on firm ground. For a man that has lived his life under the lights, in the dying moments with the ball in his hands, there is really only one logical answer but he can’t reason with that boring existence. Nelson Muntz from The Simpsons and Nelson Angstrom from Rabbit, Run have something in common outside of their given name; both of their father’s left the family after saying they were going to get cigarettes. Was I the only one who saw the similarities or was it just me reaching for something that really wasn’t there? Sure there was an age discrepancy and a minor difference in income levels, but when Nelson Angstrom kept saying “daddy home” I couldn’t help but think of Nelson Muntz sobbing saying “papa”. I’ll leave that alone for now. I have always been interested in understanding to some degree in why people do the things they do? This book puts the reader right into the mind of a smart, free-spirited, attractive, young man who also happens to be a controlling, cowardly, self-centered and confused young husband and father. This was a really difficult book to read, for many different reasons, but one that today seems dated as the prevalence of these characters is all too normal. Thank you very much:) Please don’t hesitate in the future. If in this future you meet some disapproval in one of my posts please comment on any other day but Monday, otherwise your approval is always accepted.